If you’re reading this article, chances are you’re running on some version of Microsoft Windows. Being the most used operating system in the world means that it’s also the most attacked, and as a consequence receives updates very frequently. It’s always recommended to keep your Windows directory completely isolated in another partition so that if anything happens to system files, you can just wipe out that partition and install a fresh copy of Windows without losing your data. Over time, the Windows folder fills up with backup files, temporary files and whatnot, taking up precious storage space. There’s even a couple of features of Windows that use storage space. For SSD users, space is even more precious than for us regular HDD users, so it gets vitally important to keep space used in check. Here’s a few ways in which you can reduce the size of the Windows folder and save some storage space in the process! It’s a very obvious solution, but disk cleanup included with Windows is a pretty handy tool to get rid of temporary files and other unnecessary stuff. Simply right click the partition on which Windows is installed, click Properties and click “Disk Cleanup” under the pie chart displaying space used. From here you can get rid of old backups, temporary files and a lot more. Consider it a start to your cleanup routine. Even though Disk Cleanup is a useful tool, it doesn’t touch some advanced temporary files. If you really want to get rid of all of them, use a free tool like CCleaner that can even get rid of cookies, program data, icon cache and much more. Most of this is stored on the system partition, so you’re going to see a fair amount of change if done after a long interval. Just make sure you don’t delete stuff you actually need, like menu order cache or tray notifications cache. System Restore is a nifty feature that lets you revert your files and settings to a previous stage if something goes sour after a faulty install or hardware change. However, since it’s practically doing a rollback, Windows keeps old versions of files on disk and this takes up space. 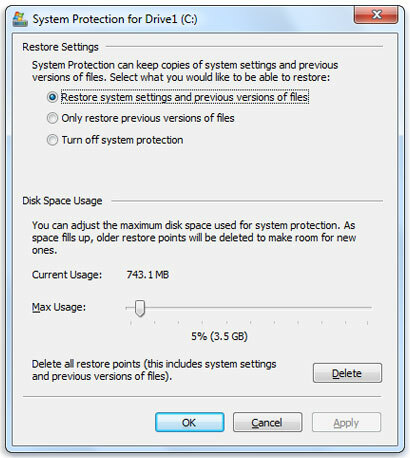 There’s two options now, you can either reduce the space you want to allot to system restore, or simply get rid of the feature altogether, if you’re confident about keeping everything running well. Go to the System Protection tab and click Configure to get a screen where you can adjust reserved space, set it to a value you are comfortable with. Go to the System Protection tab and click “Turn off system protection”. Hibernate is an option in which your computer goes into a low power mode, saving the current state in a designated file on the hard disk. This uses up a fair amount of storage space, and if you don’t use hibernate at all, it’s a waste to keep that space reserved. The easiest way to disable hibernate is through the command prompt. All you need to do is run command prompt as Administrator and type “powercfg /hibernate off”. To turn it back on, simply replace “off” with “on”. If you’ve ever run the disk explorer on your system partition, you’ll find that there’s one folder called “winsxs” that’s taking up most of the space. The WinSXS folder holds all the backups to system components, like Windows Updates, old DLL files, and service pack backups. Windows 7 and 8 automatically clean out what they can from this folder within 30 days or you can do it manually via disk cleanup. If you’re a Windows 8.1 user however, you can manually do a cleanup using the a few commands in Command Prompt. The following command removes all files required to rollback a service pack. So use it only if you’re having no problems with the current service pack you’re running on. It will have no effect on computers without service packs. Finally, the following command removes old versions of all updates and components so there’s no going back, again, use with caution. There’s a couple of other ways to reduce the space Windows folder occupies, but a lot of them involve simply deleting files within some folders. They might work, but we don’t recommend it. Drop us a line if you have any more ways to cleanup the Windows folder and let us know if the above ways worked for you! Most use Operating System and we can manages diff like reduce work space etc..